Big Band Library: August 2011 "Big Band News"
AUGUST 2011 "BIG BAND NEWS"
Naturally, much of the Lunceford's greatest material is here, such as My Blue Heaven, Margie, Rhythm Is Our Business, Sleepy Time Gal, Swanee River, For Dancers Only, and Organ Grinder's Swing, with talented sidemen including trumpeters Paul Webster and Gerald Wilson; trombonist Trummy Young; saxophonists Willie Smith and Joe Thomas; pianist Ed Wilcox; drummer Jimmy Crawford; and arrangers Sy Oliver and Eddie Durham. Wilson, still alive at age 92, comments, "At the time I joined Jimmie Lunceford's band, they could outdraw any band in the country. Benny Goodman? We were more popular than Benny Goodman!...We could outdraw any band in the country. They [ Lunceford's outfit ] were the forerunners, between swing and bebop. They were right there. And their records prove this. One of the greatest bands of all time." Of sonic note, Mosaic was forced to employ mint-condition vinyl recordings from private collectors for much of the source material. "The discs used for this release came from commercially released 78s and vinyl test pressings as a majority of the original Decca metal parts no longer exist in the Universal Music vaults," it is explained. Matrix 61552-B, Honest and Truly, recorded January 26, 1937, was located only on the Decca Jazz Heritage LP "For Dancers Only" (DL 79239) in "simulated stereo." A dozen of Lunceford's World transcription selections, made in Decca's studios in 1944, evidently had to be sourced from Circle CLP 92, and five more of his 1944-45 tracks had to be sourced from, surprisingly, one of the Chronological Classics CDs. The liner notes to the Mosaic set, penned by Eddy Determeyer, researcher and author of the Lunceford biography Rhythm Is Our Business, offer a fine summary of the band's history. "Lunceford’s Decca period began in 1934, and coincided with his booking at The Cotton Club, an important launch pad for so many bands of the Swing Era," Determeyer explains. "It was a reputation-making engagement for Lunceford whose dedication to expert musicianship, was something you’d expect from a man who had been a music educator before taking his former high school band on tour. His line-up remained intact through much of its span, which helped fuse the Lunceford style. He was also a consummate showman, who rehearsed his band endlessly through blistering ensemble sections while incorporating visually enthralling choreography that included the trumpets throwing their horns into the air in unison and catching them on cue." The very generous 29 photographs for the booklet include some images never-before-seen from the Joe Thomas archives held at the University of Missouri-Kansas City Library. I imagine that this set will be wildly successful - and the pressing is limited to 5,000 copies - perhaps Mosaic will next offer the Lunceford Columbia and Vocalion sides, which were once collected in a boxed LP set by CBS France but, other than a single Sony CD and the variable Classics "Chronological" series, have not been as widely available on compact disc. Roulette album "Chairman of the Board" (SR 52032) plus bonus tracks. "The Three Herds" (Columbia CL 592) plus 14 additional tunes. The Rendezvous Ballroom, Balboa Beach, California. Red Nichols. "Complete Brunswick Sessions Volume 1-3," Jazz Oracle [ UK ] 8062. ---. "Complete Brunswick Sessions Volume 4-6," Jazz Oracle [ UK ] 8063. 3-CD set. ---. "Complete Brunswick Sessions Volume 7-9," Jazz Oracle [ UK ] 8064. 3-CD set. Various artists. "Winter Wonderland - A Christmas Celebration," Jasmine [ UK ] 149. 2-CD set incl. Waring; Lombardo; others. Park, Waterford, CT; Aug. 13, Spanish Ballroom, Glen Echo Park, Glen Echo, MD; Aug.
Cincinnati Country Club, Cincinnati, OH; Aug. 19-20, Conner Prairie, Fishers, IN; Aug.
New York State Fair, Syracuse, NY. 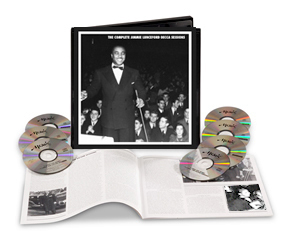 Showing it's never too late for great music, the legacy of bandleader Jimmie Lunceford can now be more fully appreciated, thanks to "The Complete Jimmy Lunceford Decca Sessions" (Mosaic MD7-250), remastered by Andreas Meyer, who did the sound on Mosaic's '30s and '40s Artie Shaw and Louis Armstrong sets. The Lunceford titles cover recordings made from September 4, 1934 through August 9, 1945, including transcriptions which the band made for World Broadcasting Systems. Glenn Miller Productions is once again sending a "special unit" of The Glenn Miller Orchestra, directed by Rick Gerber, into Mexico. Of course, besides the famous Miller warhorses, they'll likely include such songs as Say "Si Si," Perfidia, and Adios. The band arrives on the 18th of this month, then begins a series of appearances including Aug. 19, Teatro B. Abad in Cuautitlan; Aug. 20, Fiesta Latina in Ecatepec; Aug. 21, M. Doblado in Leon; Aug. 23, T. Metropolitan in Mexico DF; Aug. 26, Teatro Galerias in Guadalajara; Aug. 27, T. De La Paz in San Luis Potosi; and Aug. 28, at the Convention Center in Fresnillo. They depart Mexico on the 29th. of T. Dorsey Orch. '66-'67. Frank Capp, b.August 20, 1931. Drummer with Kenton '51; Hefti '52. Peter Appleyard, b.August 26, 1928. Vibraphonist with Goodman '71-'77. they attract a younger audience as well." Brian Belton. "B.B. 's Big Band Beat," In Tune International, No. 234 / August 2011, p.34. Reviews of recent Ellington and Goodman CDs. Master Recordings Broke New Musical, Social Ground," DownBeat, Aug. 2011, p.36. Critics voted Mosaic's latest Ellington CD set as "Historical Jazz Album of the Year." that it could be so much better. Aug. 14, 2011. A missing piece of coral-colored concrete on Miller's "Walk of Fame"
star, laid down on February 8, 1960 at 6915 Hollywood Blvd., will be fixed. John McDonough. "Books: Satchmo's Second Act," DownBeat, Aug. 2011, p.77. Dec. 21, 2010 at the age of 84. Tom Nolan. "Artie Shaw: Restless spirit," Jazz Journal, Volume 64 No.8 / Aug. 2011, p.6. 2011, pp.15-16. Discusses the Kenton DVD produced by Jazzed Media. chronology of Glenn Miller's AAF orchestra continues, now through September 3, 1944.
the 2005 Ellington documentary by Gary Keys, now available on DVD. Eloise Marie Valadez. "Glenn Miller Orchestra brings legendary sound to region,"
a wonderful sound. Everybody tries to emulate it but nobody comes close." of a report about a June 26, 1956 appearance of The New Glenn Miller Orchestra. the '60s, including the Jean Goldkette orchestra.